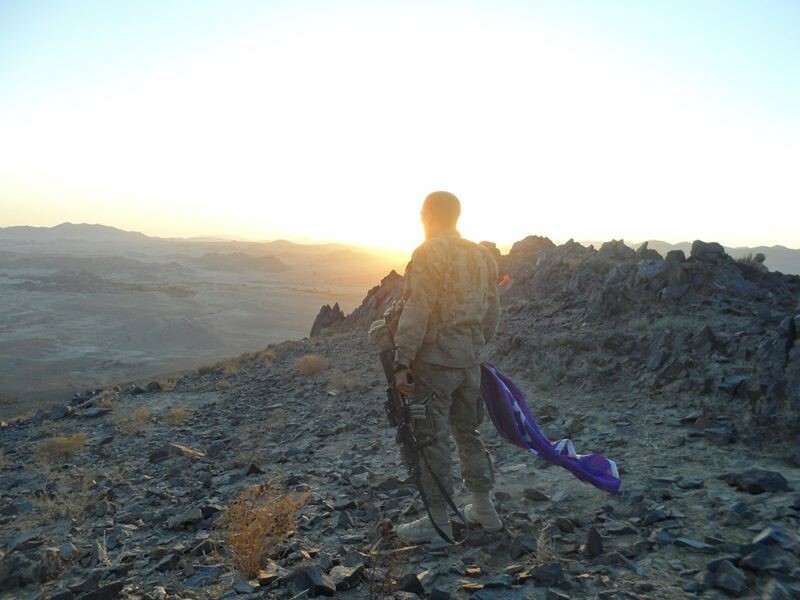 Today, read the stories of student veteran Phillip George, a Haudenosaunee student veteran, and Beth Kubala, an employee of the Institute for Veterans and Military Families on campus. Philip George knows what it’s like to feel like an outsider. The junior international relations and religion studies double major in the Maxwell School of Citizenship and Public Affairs and the College of Arts and Sciences first moved to the Oneida Nation of the Thames River from the city of London, Ontario, Canada, when he was 12 years old. The son of a Mohawk and Cayuga mother, and Oneida father, George was the new kid on the reservation and felt those differences having lived off Indigenous land for the first part of his life. Registered under the Oneida tribe, he discovered and connected with his heritage after his move and took to heart the injustices that his people had faced. After high school, he earned credits through American Christian University, an accredited arm of Oklahoma University before falling on hard times. As a new father, he went through a separation and experienced financial distress during the 2008 recession. He moved around Canada, working painting and construction in Vancouver and later Ontario before enlisting in the U.S. Army. Philip enlisted when he was 29 and completed basic training at Fort Benning in Georgia. From there, he was stationed at Joint Base Lewis-McCord in Washington. Just 30 days after he arrived in Washington, he was sent to Afghanistan for five months. He completed a second nine-month tour less than two years later. 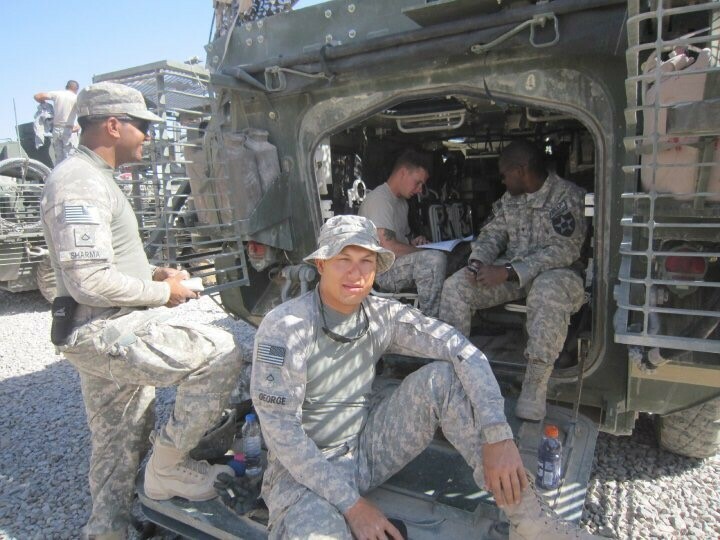 While deployed, Phillip did struggle with some missions where he drew parallels between the colonization of Indigenous people and the mission’s assignments to organize Afghan communities. Despite such challenges, several members of his unit were curious and respectful of his heritage, helping him embrace the identity he was still uncovering for himself. After leaving the military, he returned to Ontario and embraced life as an Indigenous person—learning more about his native culture and language. Still seeking that sense of identity, he toured Syracuse University with a friend who was already a student. Encouraged by the University’s commitment to the Haudenosaunee people, he applied, was accepted and began his coursework in 2015. 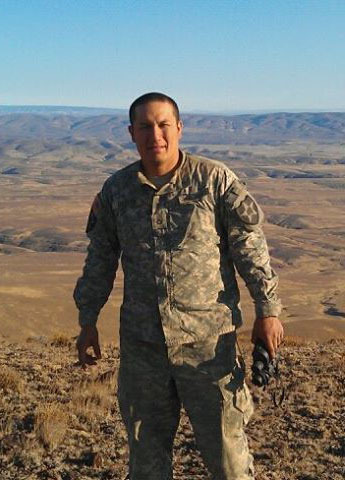 As much as he enjoyed going to school, he felt isolated and stressed as an older, Indigenous student veteran—feelings he was familiar with from his first years on the reservation. The University’s commitment to veterans, however, has given Philip a sense of belonging. Recently he toured Washington, D.C., as part of a career immersion trip organized by the Office of Veteran and Military Affairs Career Services. The trip is designed to introduce student veterans to potential employers and prepare them for careers after graduation. “In addition to how rewarding it was seeing all the opportunities available to me in D.C., being around other student veterans with similar experiences gave me that connection and understanding that I have been looking for,” says George. Having found more sense of community, Phillip plans to pursue career work that connects tribal and international governments so that indigenous leaders can have more of a say in global affairs. Tell me about your path to joining the military. My dad served as an Army reservist but I didn’t grow up thinking of myself as a military brat or planning to spend a career in the Army. Still, I knew West Point was a great opportunity and I was excited about the chance to attend a four-year college that in addition to academics, included elements of physical fitness and leadership. 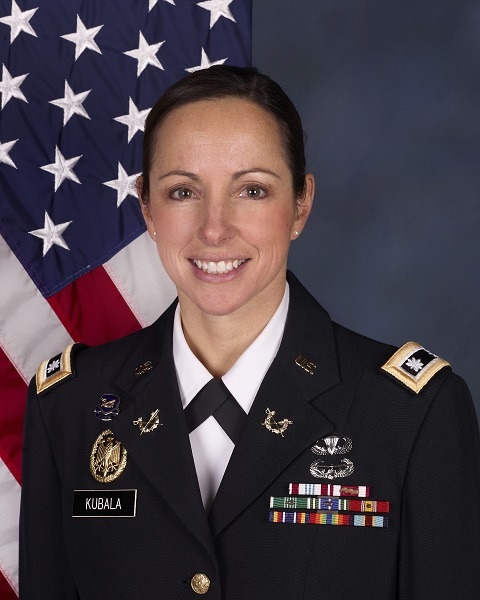 I was fortunate to be selected to attend the United States Military Academy at West Point, New York, and upon graduation I was a second lieutenant, beginning my military career as soon as I walked off the stage with my diploma in hand. What was your Army life and duties like after you graduated from West Point? Following graduation, I did intelligence training at Fort Huachuca, Arizona, where I met my husband, Mike. Together, we spent our first assignment at Fort Hood, Texas, where I was a military intelligence officer and Mike was a helicopter pilot. We were there for about four years before I was selected for a program where the Army sends active duty officers to law school. After getting my law degree from the University of Missouri Kansas City, I became an Army JAG officer and served in the Judge Advocate General’s Corps. My husband and I continued to balance our careers and family, moving seven times and welcoming three kids during more than twenty years of service. What have been some of your most rewarding military experiences? I really enjoyed role as a military JAG. I held so many different jobs—I provided basic legal assistance to soldiers and their families, I served as a criminal prosecutor, I worked on the Army’s legal team at the Pentagon, and I served as a public affairs officer for the Guantanamo terror trials. Combining leadership and legal skills to help soldiers and commanders make decisions on and off the battlefield was very rewarding. Many people may not know that the military educates attorneys to be both prosecutors and defense counsel to ensure that service members charged with a crime or under investigation are equally represented. I was proud to be part of that system of justice. I saw those legal protections in action during my last assignment at Fort Drum where served as a military judge. Overseeing all of the military criminal trials at Fort Drum, West Point and Fort Dix., I observed firsthand capable, uniformed attorneys providing excellent representation to their clients. What are some of your biggest takeaways from time in uniform? My military career helped me develop a good sense of how to juggle and manage priorities, and resource teams to effectively get things done. In the Army, our motto was “people first, mission follows.” I think that holds true in all facets of life—if you take care of people, the work will not only get done but it will get done well. Why did you decide to leave the military and what was it like to transition out? My husband was assigned in Syracuse to oversee the ROTC attachment. I joke that the worst thing the Army ever did for us was assign us to such a nice place. We chose to live in Syracuse and in doing so, became part of a great community, our kids were enrolled at great schools and when it came time to think about our next assignments it was the first place (besides beautiful Germany—I cried when we left there!) where we didn’t want to leave. So, we retired and stayed. It was, and continues to be, a great decision for our family. What is life like for you now as a veteran? I like to think I am continuing my career of service working for the Institute for Veterans and Military Families where am able to stay connected to the military community and serve those who are serving like we once did. What is also unique is that I am now part of a community that includes people at other veteran service organizations—many of who I actually served with during my time in uniform. Family life is also so fulfilling. I am thrilled that my oldest son is an ROTC cadet here at Syracuse and I love seeing him thriving as part of a team. We didn’t push him into ROTC but it’s worked out really well for him. My middle child recently completed a lacrosse camp at West Point. If he decided he wants to go there, I certainly wouldn’t stop him. Our youngest is 13 and finding her groove in school and sports. It will be interesting to see if she decides some facet of service is right for her. Speaking as someone who is both a veteran, military spouse and active in the military community, what does the future hold for veterans and military-connected members of our communities? I think it’s fantastic to see the overwhelming amount of support, resources and programs out there aimed at helping veterans make that shift back into civilian communities. It’s encouraging and personally rewarding for me when I come across friends in transition and see them benefitting from IVMF and Syracuse programs. 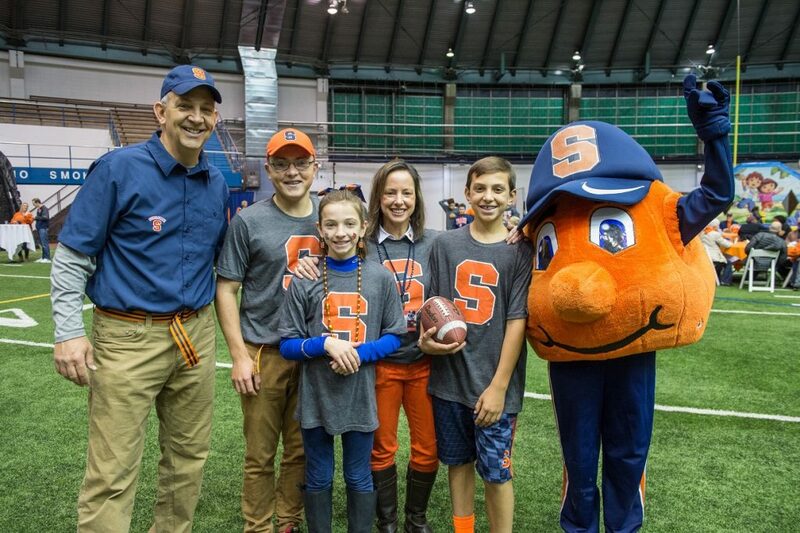 As a parent of an ROTC cadet, I am proud of the work Syracuse University is doing to be the best place for veterans and military-connected students. The Army played a huge role in getting my family to where we are today and I am glad to be part of programs that work on delivering the same positive transitions for my fellow veterans.